SWGB Heaven » Forums » Modpack Discussion » SLX Studio - A new SLP and DRS mod tool. Topic Subject: SLX Studio - A new SLP and DRS mod tool. but it can be used in all genie engine games, such as Galactic Battlegrounds, Age of Empires, and Age of Empires II. Download SLX Studio v1.3a from the Download Section here. - Convert SLX to SLP / Extract SLP to SLX (and batch versions of these). - Support for both 8-bit and 32-bit SLP versions with additional support for 8-bit AoE1 SLPs and all 10 player color indices. - Extract or Create DRS files for each game. - Double-click graphic image for fast anchor/hotspot positioning. Also support for importing/exporting CSV files. - Viewable selection boxes (including rectangular shaped) or selection rings. - Generate Data Graphics tool with tolerance bars for shadows and player colors, creates outlines, auto-crops images, and can even split shadows into it's own SLX. This tool is necessary to convert from SLX to SLP format. - Color Palette Editor/Viewer that supports multiple formats (Jasc .pal, Microsoft .pal, Photoshop .act, GIMP .gpl, and even rendering as .png images). I've also embedded some palettes, including some commonly used ones. - Terrain tools. Create terrain SLPs of any size (rows and columns). Includes conversion tools to create an isometric terrain map from a texture image. - Batch Palette Swap tool that can be used to quickly recolor units. - Other Batch image tools for recoloring pixels, changing image format, and creating data images. - GIF tool with transparency support. - SLP and DRS Viewer tools that can save anchor changes. - Play animation support for SLX with speed settings. - Zoom image support for SLX frames. 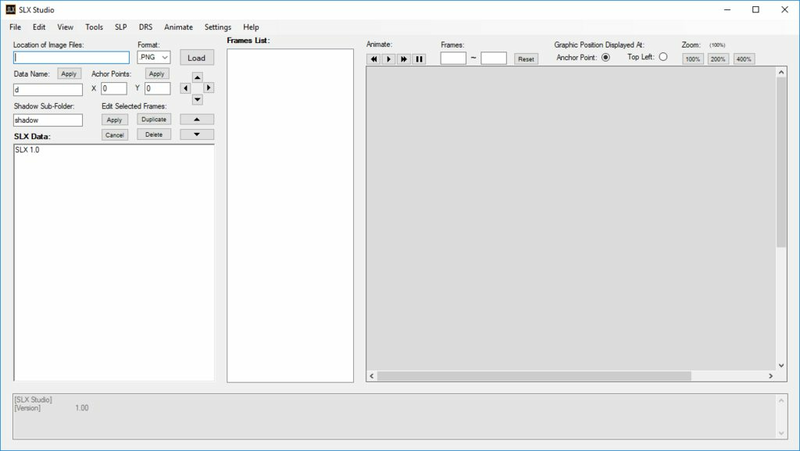 - FX Editor tool to draw various effects on frames such as various sparks, weapon fire effects, engine fire effects, transparency, holocrons, relics, and more! - Delta Object Positioner tool to determine various object positions for things like snow and fire on buildings. Positions can be exported as CSV files to then manually imported into AGE. You can view a guide for using SLX Studio here (WIP). Would this be a good tool to use for adding 3D models to new units? I'd like to try and lend a hand at making units for the Expanding Fronts mod (mainly to work on a faction for the Black Sun). This tool would be used to convert rendered frames of your 3D models (doesn't work with 3D itself) to SLP format, which the game uses for 2D graphics. As for adding Black Sun, see my post in the EF thread. Updated SLX Studio to version 1.1! You can download it from the download section or the Discord server. - Overhauled player color detection in the Data Graphics tools. Now you can choose to use a preset color array and/or up to 3 different colors to detect player colors in graphics. - Added radius option for Omit Grays in Data Graphics tools. - Added CSV support for custom DRS lists in the DRS Viewer. CSV files must be at the same location and named the same as the DRS file. - Added CSV support for building DRS files. This allows you to keep resource files with alphanumeric names and assign ID numbers with a CSV file. - Added auto-positioning when opening SLPs in the SLP or DRS Viewers. - Terrain Builder now properly uses the selected color palette for SLPs without needing to also set the palette in SLP Color Settings. - Added "PlayerColorSetIndex", "PlayerColorGroup", "PlayerColor2", "PlayerColor3", "GrayRadius", and renamed "PlayerColor" to "PlayerColor1" in the .ini configuration settings file. - Fixed an issue with SLPs having partially broken lines in some rare cases. - Other fixes and improvements. When building a DRS with a CSV file, it will search for the file within the CSV file's folder path unless another directory path is provided. - Fixed an issue with AoE1 terrain elevation frames being drawn incorrectly on PCs with high DPI settings. - Fixed shadows for AoE1 SLPs. - Added Batch Replace SLP Colors tool to the SLP menu. Changes all instances of a color index to another index and exports all altered SLPs to a destination folder. Updated SLX Studio to version 1.2! You can download it from the Downloads section or the Discord server. - SLX Studio now utilizes the %temp% folder. All progress, including graphical changes, is only applied to your SLX project once saved. - Added "Undo" option to the Edit menu to undo all unsaved progress. - Added "Refresh All Images" and "Refresh Selected Images" options to the Edit menu to update frames with their source images and data images. - Added "New" (blank SLX) option to the File menu and moved "New Custom SLX" from the File menu to the Edit menu as "Generate Custom SLX Data". - Replaced the Color Picker dialog with a new one by "Cyotek". Now supports 32-bit colors and features a screen capture eyedrop tool. - Added "DRSPath" in the .ini configuration file as the default browse folder location for building DRS files. - Added "QuickDRSPath", "QuickDRSFilename", and "QuickDRSType" to the .ini configuration file and added a Build > Quick DRS option in the DRS menu. Use these to set up a DRS that you frequently build. - Added a 4th Player Color button to the Data Graphics tools and "PlayerColor4" to the .ini configuration file. - Added Mirror Image tool. - Updated EF_Graphics color palette and the EF Color Set. - Added palettes from AoE: DE and AoK: HD to the palette list and updated the "Palette#Name" and "Palette#Path" entries in the .ini configuration file. - Auto-palette now correctly selects the palattes for AoK:HD SLPs with special palettes (trees/cliffs). - Changed the way Auto-palette records color palette indices within SLX Studio created SLPs, which should fix certain types of AoKHD SLPs from crashing. - Added "Advanced SLP" option when exporting to SLP to customize variables such as the SLP version, comment, frame palette offset, frame palette properties, and other settings. - Removed Directory and Options groups from the FX Editor, as they are now unnecessary. All results from using the FX Editor can now just be saved as a new SLX project to avoid overwriting your initial SLX project. - Splitting shadows in the Data Graphics tool will now prompt you to Save As a new SLX project for the generated shadow SLX. Frames will be created at the location of the SLX file that you save. - Loading a Shadow SLX now prompts you to open a shadow SLX file instead of using the "Shadow Sub-Folder" field. - Replaced the "Shadow Sub-Folder" text box on the main form with a SLP Color Palette combo box for convenience. - The .ini configuration file will update entries upon first loading a newer version of SLX Studio and without overriding your existing changes. - Preview image on the main form will no longer crash. - Fixed crashes with Generate Data tool when auto-cropping blank frames. - Fixed an issue where certain SLPs that were both 32-bit and 8-bit weren't reading correctly. - "Batch Extract SLP to SLX" now functions again. Updated SLX Studio to version 1.3! You can download it from the Downloads section or the Discord server. - AoE Deluxe Edition 4.0X SLPs are now fully readable with shadows. - Implemented "4.0X DE SLP" as an export option for Export To SLP. - Using 0 padding (X and Y) with Auto-Crop in the Data Graphics tool should now correctly have no background padding. If using outlines, a minimum padding of 1 is forced due to how outlines are drawn. - Corrected SLP and DRS Viewers to properly use only Read status, except while saving, to prevent locking of files. - Updated Delta Object Positioner to work with newer SLP options. - Improved the way files are renamed and deleted. Deleted images are now sent to the Recycle Bin. - Added "AnchorColor" to .ini configuration settings to change the color of the anchor crosshair. - Added SlpMaskOnToggle, SlpShadowOnToggle, and SlpOutlinesOnToggle to .INI configuration settings for SLP and DRS Viewers. - Replaced "CustomPlayerColorSet" items in the .INI configuration settings with "CustomPlayer#StartIndex". Set the start index for each player color and then each entry in the custom palette from that point for "CustomPlayerColorsLength" colors in length will be set to the colors for that player. - Updated EF color palette and grey color set. - Double-clicking the graphic image now gets anchor point coordinates for zoomed graphics. - Added new file association options for .PAL, .ACT, and .GPL. - Palette files opened with SLX Studio will now automatically load straight to the Color Palette Editor. - Added some "Omit Alphas" checkboxes to Tolerance bars which will ignore differences in color opacities. - Added "Select" button next to the "Reset" frames button on the main form to set the selected start and end frames. - Added shortcuts "Shift + S" to select the frames range and "Shift + A" to reset the frames range to all frames. - Added new "stun_sparks" FX to FX Editor. - Added an 8 direction (E, SE, S, SW, W, NW, N, NE) option for some FX. - Added a "Sort Frames Alphanumerically" option to the Rename tool. - Added additional zoom options by clicking the graphic while pressing Ctrl to zoom in and Alt to zoom out. - Fixed anomalies with zoomed graphics that contained transparent pixels or the mask turned off. - Fixed Auto-Crop in the Data Graphics tool from converting 32-bit graphics to 24-bit. - Fixed SLP Import to properly open the created SLX project. - Fixed lag when using "Apply to All" or the "Ctrl + A" shortcut to select all frames. - Fixed blurred edges with Resize Image tool. - Fixed an issue with SLPs where pixels would be displaced by 1 pixel after a very large gap. - Fixed a crash with "Create Terrain Map From Texture" tool. - Several other fixes and improvements. [EDIT] Updated again (04/11) with version 1.3a to fix some things that broke with v1.3. - Fixed bugs introduced with new features from v1.3. - Rearranged some keyboard shortcuts. - Fixed "Save All Frames" options in SLP and DRS Viewers to correctly display 4.0X SLP shadows. - Fixed crashes for OpenFileDialog and SaveFileDialog with High Contrast Mode. - Ctrl key + shift buttons now shifts selected frames to the top or bottom. - Fixed crashes when trying to save an SLP that is already opened or in use. - Added "gun_smoke_big" FX to FX Editor.